Find Battery B on Google Earth or other mapping programs. IFC area coordinates are Latitude 40.27315, Longitude -79.76300. The Launch area is Latitude 40.2631, Longitude -79.76516. Google Earth—in “fly to” box, enter numbers only for Latitude and Longitude. Always enter Latitude coordinates first . Don’t forget to include “minus sign” for Longitude. Click on magnifying glass icon to fly to the coordinates. The coordinates will remain in your “Fly to” log. (1) Go to Google Maps. 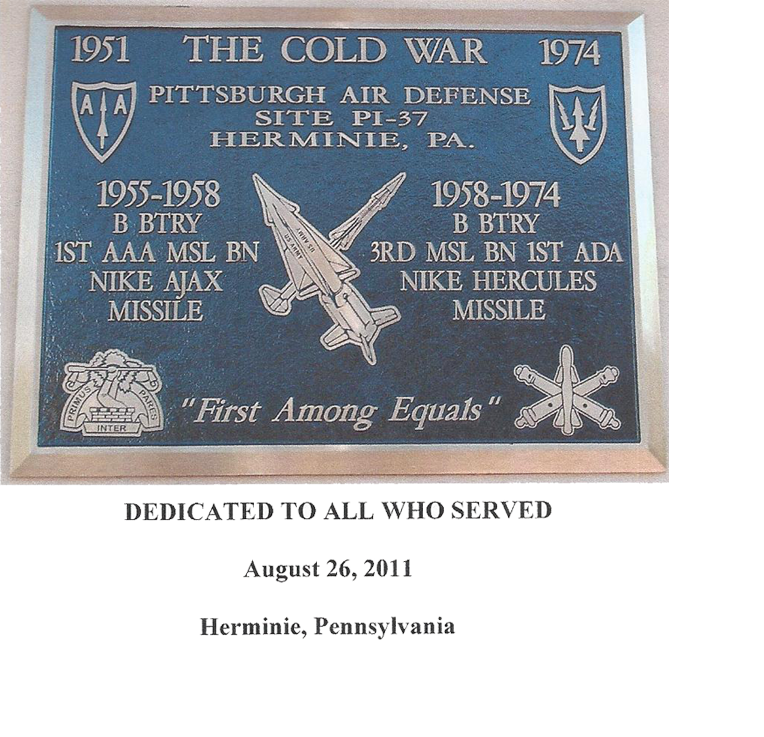 (2) Enter “Mars Hill Storage, Rillton, PA. (3) A red tear drop marker will appear. That is the intersection of Mars Hill and Slaughter Hollow Rd. The Launcher Area is South of the intersection and the IFC Area is North. (4) Zoom in and move around until you have your desired picture. The detail is amazing! This site is dedicated to the men of B Battery, 1st AAA Msl Bn, and B Battery, 3rd Msl Bn, 1st Artillery Regiment. As the Nike Ajax system underwent testing during the early 1950s, the Army became concerned that the missile was incapable of stopping a massed Soviet air attack. 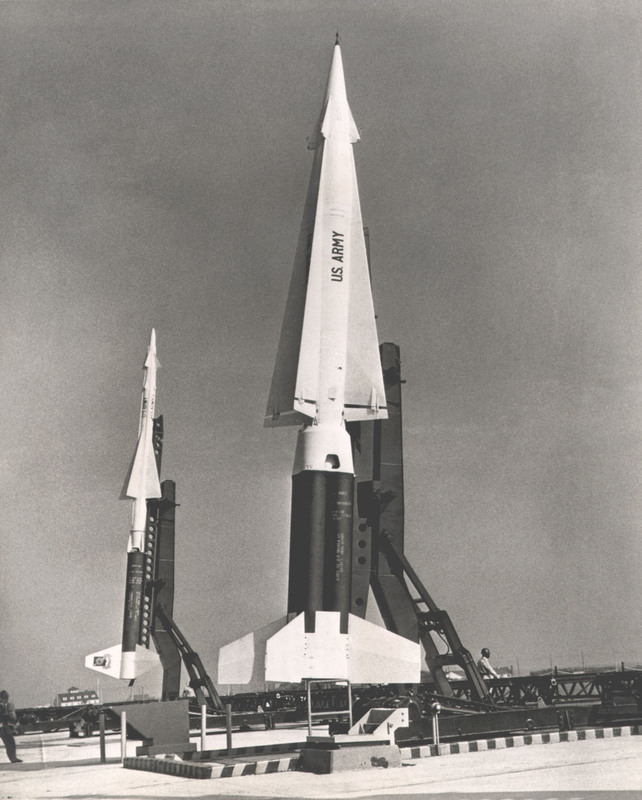 To enhance the missile’s capabilities, the Army explored the feasibility of equipping Ajax with a nuclear warhead, but when that proved impractical, in July 1953 the service authorized development of a second generation surface-to-air missile, the Nike Hercules. As with Nike Ajax, Western Electric was the primary contractor with Bell Telephone Laboratories providing the guidance systems and Douglas Aircraft serving as the major subcontractor for the airframe. In 1958, 5 years after the Army received approval to design and build the system. Nike Hercules stood ready to deploy from converted Nike Ajax batteries located in the New York, Philadelphia, and Chicago defense areas. However, as Nike Hercules batteries became operational, the bitter feud between the Army and Air Force over control of the nation’s air defense missile force flared anew. The Air Force opposed Nike Hercules, claiming that the Army missile duplicated the capabilities of the soon-to-be-deployed BOMARC. Eventually, both of the competing missiles systems were deployed, but the Nike Hercules would be fielded in far greater numbers over the next 6 years. Here are two links of interest found by Tom Zangla. They are archived videos each about 30 minutes in length. Tonight I received notice from Carole Gerwing of the passing of Ted Gerwing, one of the Battery Commanders of the Herminie Nike site. Ted served there 1966 – 1969. I had the privilege of meeting Ted in 2006 and was impressed by his calm but strong demeanor. At the 2008 and 2011 Herminie reunions, I heard many good comments about Ted from the enlisted men and officers who served under him. Ted was a good man and a good soldier and he will be missed. His Obituary link is below. Copy and paste. Please visit there and leave a note. I received the following post on July, 9. If you remember Robert, please contact him at the email address he has given. My name is Robert N Pollard. I was a Sp5 Section Chief at the site from 3/73 until 10/73. This was my last active duty assignment. Before this assignment I was assigned to Foxtrot battery 4th BN 44th ADA in Korea. The unit and the area was a very nice assignment. My wife and I lived in the apartments in front of the new (at the time) mall in Greensburg Pa. We enjoyed ourselves during the eight months. If anyone does remember me please send an email. I ran across this site after I started checking out the units that I was assigned to. I enjoyed the old pictures and stories. Did not see much from the 70′s. I saw William Springer Wrote a message. I was Stationed with you at South Park Military Reservation. I was there from April 1955 until we moved to Irwin. I was discharged on January 24th 1957. I think you may have worked with Bob Cashen. I worked in S1. I’m sure you also remember Sgt Conner. He lived in Boonville, Mo. My wife & I had breakfast with him some years ago. What a nice man he was. I ran around with Jim McKinnes, Bob Mocricki, Bob Cashen, Harry Bruce. Harry died of cancer in 2011. The last I heard of Bob Cashen He was a judge in Wyoming, Ill. I talked to Bob Mocricki on the phone today. He lives in the mountains in New York somewhere west of Albany. Bill toal is in New Jersey. We keep in contact thru E-Mail. McKinnes is in Wisconsin. Jack Redgate was our company clerk. I’m sure you remember living in the nice tents with the pot belly stoves. I was stationed at 1st AAA Missal Bat., Headquarters Batallion at South Park Reservation from april 1955 until we moved to Irwin around Oct. or Nov. of 1956. We lived in tents, I think they called them “JAMES WAY’ huts. It got pretty cold in the winter. We Had pot belly stoves with oil adaptors in them. Two feet away from them you froze. I seperated from the Army 1-24-1957 & attended Fort Hays State College In Hays, Kansas two days after I got home. I enjoyed guys I was stationed with. We did have a few drinks in the Carlson R House in Bethal Park. By the way, I helped put up the tents. I remember it was raining & there were still foot prints on the ceiling of the tents when we left South Park. I worked in Personnel. Hi, Frank. Sorry I have not responded! I have become lax about viewing the aradcomsite.37 site. Will do better in the future. I’m very glad you are doing well. Keeping busy I’m sure. I spoke with Cpt. Gerwing about 3 weeks ago. He lives in McKinney, not too far from me here in Dallas. He spends most of his time at home, because of his illness. Thank you for your comments about the 2008 and 2011 Herminie reunions. I am very glad you were there to give those very knowledgeable narrations during the tours at the Herminie, PI-37 Nike Site. Glad we captured those on the Reunion videos! Best to you. Please keep in touch. Just to let you know I’m still doing well. Do you know the latest news about Cpt. Gerwing. I showed my oncologist my military ID from 1970. He said I looked really tough. I greatly enjoyed the re-unions, thanks for putting them together. Hope your doing well and your family. crest but not the 74th. I just found this sight. I am assisting a veteran with several cancers in a service connected benefits application to the VA. We have established the diagnosis and the cause related to the chemical TCE, but the service record book does not contain any evidence TCE was used as a cleaning solvent at his stations. He served at Fort Bliss and Thule Greenland between 1964 and 1967 as an anti-aircraft radar operator. Can anyone confirm the use of TCE at these locations betewwn 1964 and 1967? Any help would be greatly appreciated. Thank you. Hi Don, I was just trying to get on the rolls of B 3 1. I was telling the guys that I was at Herminie in the fall of 71 and was sent to Germany in summer of 72. I was a crewman out of Bliss, but was fought over by supply and the pits, supply won. Look forward to hear from ya. Loved working there – great bunch of guys too – and met my first wife there too – take care – H.
An email from Scott Hudson last week informed me that M/Sgt. Franklin Hudson passed away on October 8, 2013. Beginning in 1957, Sgt. Hudson served as Launcher Crew Chief at the Herminie Nike site. He served there 8 of the 10 years, beginning in 1957 and ending in 1967, when he was assigned to Korea. He served as a Recruiter in the Pittsburgh area from 1968 to 1971 and went to Viet Nam where he was wounded. He was medically retired from the Army in 1972. Sgt. Hudson influenced many lives and is well remembered. Please write to this Blog if you have any remembrances of him you would like to share. Our sincere condolences to Scott and his family. We are grateful for Sgt. Hudson’s service to our Country. I have received notice from Henry Jaworski of the death of Russ Hueber on January 1, 2014. Both Henry and Russ were members of B Battery, 1st AAAA Msl Bn when it was located at North Park (PI-92). We are fortunate to have many of Russ’s Nike related photos in the GALLERY of this website. Russ was a member of the original Ajax training package to arrive at North Park in 1955. I had many interesting conversations with Russ over the last several years. Just came across your site, having served at Headquarters & Headquarters 3rd Missile Battalion 68th Artillery Snelling Air Force Station Minneapolis/St Paul Minnesota in 1964-1966 Signal Corps communications as a Crypto & Teletype Repairman. Base was bulldozed after 1971 and became part of the National Cemetery by the airport…would like to hear from any Crypto people or anyone..
Hey, Bob! Good to hear from you! Hope all is well. Hope we can do another Reunion and tell some more stories. I chat with several Herminie veterans by email, but always good to see comments here. I think we have many folks viewing this website, but few are writing. I’m hoping more Nike veterans will let us know they are out there. Johnny Wanless passed away on September 23rd at the age of 73. He lived in Elkins, West Virginia. John served at Herminie 1958 – 1961 as Acq/Computer operator and was one of my closest friends there. We had kept in touch over all these years and had visited with each other several times. He and his wife, Norma, attended our first reunion in 2008. He was a good person and a good soldier. Sadly, I have received word of the passing of Robert(Bob) Joy on September 10, 2013. He lived in Monongah, WV. Bob, along with his brother, Joe, served at PI-37 from 1959 to 1962, which gave me the privilege of knowing both of them. Loved that West Virginia humor! Bob was a very able MTR operator. He attended our first reunion in 2008. He will be missed! Looking for George Shannon, of the Pittsburgh Defense, back in the 60′s. We went through OBC together at Ft Bliss Apr through mid-June 66. Last time I saw him was in late 67 when he visited my Dual Herc Site at F. Tilden, NY. Looking for the ARADCOM Shoulder Patch? They have many of the Air Defense patches.